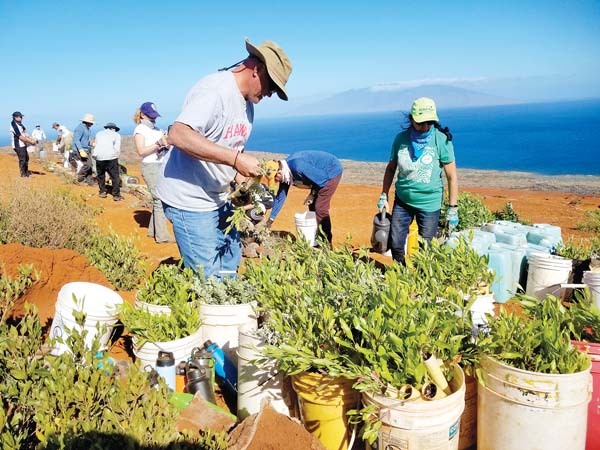 Six high schools competed in the Conservation Awareness Program — Land Judging Contest Oct. 25 at Bobby Pahia’s farm in Waikapu. The contest provides students an opportunity to learn about Hawaiian soil and water resources, then allows them to demonstrate what they have learned about these natural resources and conservation concepts, with prizes and further opportunities to compete in the state as well as national contest. The program is sponsored by the Soil & Water Conservation Districts, in cooperation with the UH Cooperative Extension Service and the U.S. Department of Agriculture Natural Resources Conservation Service. St. Anthony School took the title and will be representing Maui at the state contest, to be held in Kona on Nov. 16. First place — Daniel Tongson, St. Anthony, $50. Second place — Fiona McGrath, St. Anthony, $40. Third place — Tysja Kaanana, Baldwin, $30. First place — St. Anthony; Makena Cockett, Fiona McGrath, Daniel Tongson, Max McGrath, Nate Rabara; $10 each. Second place — Baldwin; Jayden DelCastillo, Dillon Mohikeha, Tysja Kaanana, Jordan Ouchi; $10 each. Third place — Kamehameha, Lilia Davis, Nathan Ramos, Taylor Redman; $10 each.